To round out this week of trick or treating, I'm very excited to introduce a young, talented writer I just met a couple of weeks ago, Davonna Juroe. 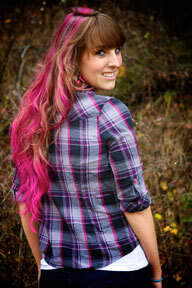 Davonna is the author of Scarlette, a novel with a different twist on the beloved fairytale of Little Red Riding Hood. 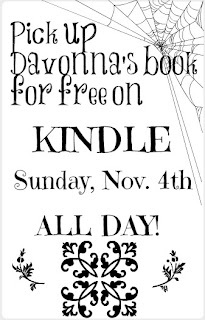 Scarlette is Davonna's debut novel. Me: Welcome! Tell us about your novel, Scarlette. 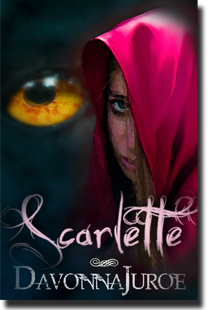 Scarlette is a YA and a dark retelling of Little Red Riding Hood that takes place against a frightening historic event, which some of your readers may be familiar with, if they're into creepy folklore. 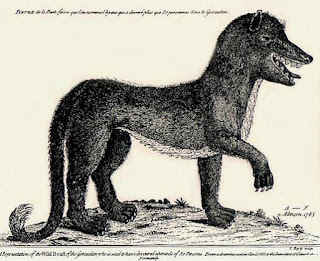 Some sixty years after French author and aristocrat Charles Perrault penned his rendition of Little Red Riding Hood in 1697, nearly one-hundred people were ferociously mauled and killed by an unidentified wolf-like creature in the Gévaudan province of France. Rumors blended with superstition, and the terrified peasantry blamed the attacks on a werewolf. They then began calling the monster The Beast of Gévaudan, and so was born one of the most famous alleged werewolves in history. After combining both the Perrault and Grimm Brothers' versions with this actual historic event, I wrote the novel as if the fairy tale might've really happened in history. Now desperate, Scarlette searches throughout her province to find a cure. But there are those who want to keep their pasts hidden. As she begins to uncover the dark secrets of her village, Scarlette is befriended by a local nobleman and a woodcutter who share a gruesome history with the beast. To save her grandmother, Scarlette must unravel their mystery and solve an age-old crime. But as she pieces together the clues, Scarlette finds herself torn between the two men, both of whom want to be more than friends and hold the key to the cure. Me: When and why did you decide to start writing? Davonna: I've been writing since elementary school. I still have stapled books of stories I wrote from when I was a kid, but I didn't take the plunge seriously until about six years ago. Before that and in college, I actually played the harp and was pursuing a degree in music, but health problems threw a wrench in my plans. So I had to switch gears. Me: I take it you enjoy reading Grimm’s Fairytales. What’s your all-time favorite magical story? Davonna: I do love the Grimms' work and fairy tales in general! So much, that when I was a kid, I wished the stories could've been real. Little did I know that that whimsy desire would be the driving force behind the vision for Scarlette. Anyway, I'd have to say that my all time favorite fairy tale is Hans Christian Anderson's The Little Mermaid. So tragic, yet a truly heartfelt story. I cry every time I read it or watch an adaptation. And, especially when I see the anime version from the 70's where the mermaid's name is Marina, and she plays the harp (This film actually inspired me to start playing the harp when I was little!). That one really gets me! Me: What’s the best part of being a writer for you? Davonna: Stories can be extremely powerful. So I'd say the best part of being a writer is sharing stories that make people feel deep emotions. Creating something that someone could ultimately carry with them for a lifetime is a great honor, and is the ultimate benefit of being a remembered storyteller. Me: What’s your favorite writing snack? Me: If you could offer any advice to an aspiring author, what would it be? Davonna: Take classes, and read every book on writing you can get your hands on. You'll learn something from everything and everyone. Also, learn storytelling structure. That is huge! If you get stuck on your story, try using an outline. Having a clear idea of how you want the story to go--before sitting down to put words on the page--can save you a lot of stress. And, networking is key. Join a critique group. If you want to write YA, the YA writing community is fantabulous on Twitter, and there are great organizations to hook up with like SCBWI. Anyway, thanks again for having me, Summer! 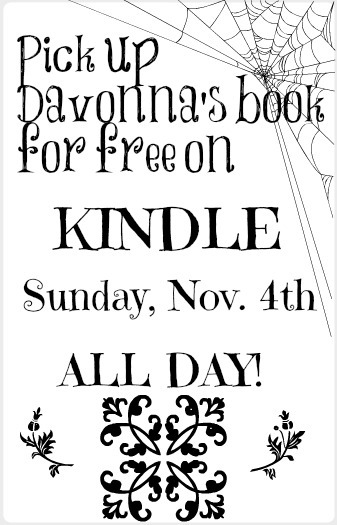 :D And as I bid you and your followers farewell, I'd like to say that as a gift to readers, Scarlette will be available this weekend--on Sunday, November 4th--all day *FREE* to download from Amazon. So bust out some hot cocoa, lock your doors, turn off the lights, and read a creeptastic new spin on the fabled girl-in-the-red-cloak. Happy reading! I love fairy tale spins so it might be worth it to give this one a try. And the author invoked the magic words: hot cocoa. I love hot cocoa. Just saying.